dipping duration: 30 sec. to 1 min. 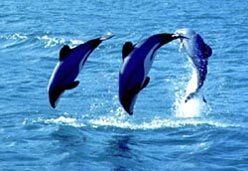 other characteristics: The Hector's Dolphin is the smallest of all cetacean species. It only lives in the waters around New Zealand. It is highly endangered and the population consists of only 3000 to 4000 animals. There isn't much knowledge about the Hector's Dolphin yet. Characteristic is it's rounded dorsal fin.